As I mentioned previously, in considering our move to France, it is very important to us that we live in a place where we can thrive and not merely exist for this last adventurous chapter of our lives. Once you have decided to move, you need to figure out where exactly you want to live. Personally, I have had a lot of experience with moving and readjusting to a new place. Due to my dad’s line of work, I grew up with a life of moving almost every year until I reached high school. As an adult, I’ve moved a few more times by choice. My husband, Norman, grew up living in the same place all the way through college until he went off to grad school. After that, he racked up his share of moving experience including living in Japan for a year. So, we’re pretty well-equipped for this aspect of our adventure. Choosing the right place to live is the key and dependent on several factors like weather, cost of living, and access to transportation. We love the climate where we currently live with its moderate temperatures and cool afternoon ocean breezes. There are a few hot and cold days during the year but nothing too drastic. So, it’s our goal to find an area in France with similar weather. With a simple Google query, I was able to identify some resources to guide me in my search. ExpatsBlog provided “Ten of the Best Places to Live in France for Expats“. On ExpatsForum, I found “The Top Five Regions in France Where Expats are Moving To“. After reading these and several other sources, I learned that Southwestern France was most likely to be the place that felt like home. Then I turned to sites like WeatherBase and Météo-France, the French national weather site, in order to find specific information about year-round weather averages for the cities and towns in Southwestern France that seemed to be probable choices and compared the stats to our own area. That’s how I finally zeroed in on two of the 22 diverse regions in France — Aquitaine and Poitou-Charentes. The next step was to buy some detailed maps of these regions. Even though I know how to navigate Google maps very well, I still prefer being able to see “the big picture” on a large scale paper map. I bought two maps, one for each region, and mounted them each on large sheets of cardboard I picked up at Costco. I studied them carefully starting with the larger, more recognizable city names and then focusing on smaller towns and cities marking chosen places with post-it arrows. We plan to purchase a car but don’t want to depend on it for all our transportation needs so I also referenced a map of TGV (Train à Grande Vitesse) lines. The TGV is France’s high-speed train running an average of 120mph which was originally developed in the 70’s for service between Paris and Lyon but has now expanded to include many other destinations. We wanted to make sure we focused on areas that would be a reasonable distance to a major train station so we can easily travel throughout the country and take advantage of the French public transportation system, one of the densest networks in the world. Based on all this information and previous experience with some of the locations, I chose a variety of cities, small towns, villages, and country locations for our first research trip next summer. 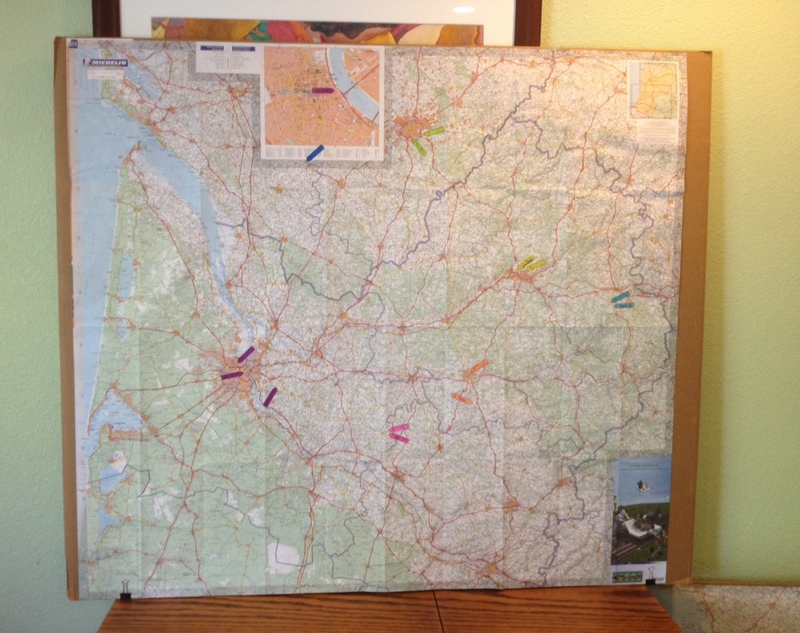 Check out Tour 2015 for a list of these locations and a map showing our planned route. After 8 weeks, we expect to come away with more specific ideas about the areas and types of places where we would like to live so we will be able to narrow the search for our future home in France.